It’s a city car, convertible, off-roader and a pick-up, and displays the latest in car design innovation – could the Toyota ME.WE be the car of the future? Unveiled today at Le Rendez-vous Toyota in Paris, the ME.WE concept is described by its creators, designer and architect Jean-Marie Massaud and the Toyota ED2 design studio as as ‘anti-excess’ vehicle, with innovative use of materials, engineering and technology. 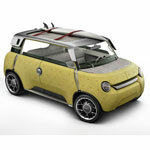 It has a tubular aluminium structure, onto which lightweight moulded polypropylene body panels are fitted. These are hard-wearing for durability and ease of maintenance, while the material can act as a shock absorber in the event of a collision. Using the same in-wheel electric motors as the Toyota i-ROAD concept means the ME.WE has the capability to switch from two-wheel drive to four-wheel drive to cover challenging terrain, while removing the normal constraints that a traditional 4×4 power train brings. This also means that entire interior can be devoted either to passengers or to cargo-carrying duty. But the clever ideas don’t stop there – the rear bench can be folded and stowed under the front seats or removed completely and used as outdoor picnic seating. Additional storage is provided with a fold-out, weatherproof neoprene cover on the roof and a extendable rear deck that turns the car into a pick-up. Bamboo was chosen for use on the floor and for the cabin’s horizontal surfaces, as it’s both a renewable resource and aesthetically pleasing. ME.WE is easy to keep clean with a simple wash, inside and out. Heating and air conditioning are delivered by a low-energy air pump and electric seat heaters to minimise power consumption, and to achieve a cabriolet-like open air feel, all the windows can be opened – even the windscreen. 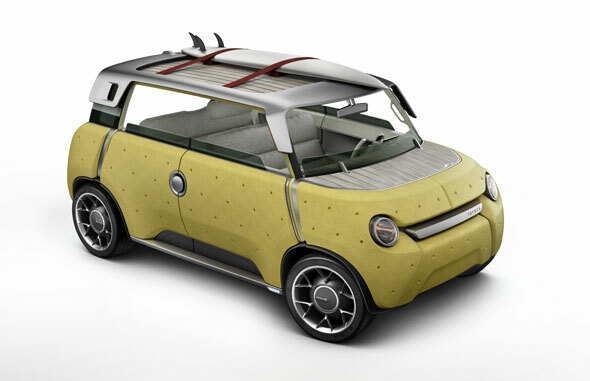 The lightweight construction using aluminium and polypropylene panels helps keep the car’s weight down to a target 750kg, about 20 per cent lower than a conventional steel-built supermini. The body panels, which are 100 per cent recyclable, weight just 14kg. See a full gallery of ME.WE images and videos at the bottom of the page. The idea behind the concept was to combine intelligent, logical thinking with a passion to create a car that’s more economical, adaptable and suitable for modern life. ME.WE also moves away from the motor industry’s tradition for excess and intends to reflect the values of forward-thinking people rather than simply their social status. The concept’s name expresses a simultaneous concern for the individual – ME – and for others – WE. Find out more about Toyota European Design Development (ED2) here. See the ME.WE in action in these videos. Watch designer Jean-Marie Massaud and ED2 president Naritoshi Kawakita explain the process behind ME.WE below. Thanks for your feedback Will. We have no plans to build at present but we will pass on your comments. Amazing!Just what we need.When will hit the market? Thank you for getting in touch. We’re pleased to hear you like the ME.WE concept. At this stage the Toyota ME.WE is a concept vehicle, there are no plans to put it into production. wonderful when it would be already available . We’re so pleased you like the ME.WE concept. As you have seen this is a concept car at this stage, we’ll be sure to keep you updated on the latest model developments here on the Toyota Blog. The inside is futuristic and promising, the outside is well..I think they spent so much time on the inside that they had no time left for designing the outside..Pity. Love the concept, especially the outer non shiny polypropylene shell which IMO would be a plus as waxing and constantly cleaning cars is not for everyone. Taking that one step further and being able to hose out the inside would make it the ultimate beach vehicle. The bench seats look interesting and I assume by seeing photos of it carrying things off the tailgate that at least the rear is easily removable. Front spacing looks good but the rear could use another 3″ for longer legged adults. 켬 뼈 컬 후 채 한 켠 ? ! Please make this a reality so that I can buy one! I like it. Nice design. Efficient designs also have their own attraction. Toyota continues to look ahead. an exciting new concept for the next genaration.At what price?? This is just a concept, for now. As such, there is no price affiliated to the Me:We. Very glad you like it, though! Apart from the GT86, this is the first Toyota in years that actually interests and excites me. It has much of the flavour of Nissan’s much-missed Pike Factory trio, yet is modern and fresh. Well done to the design team. I want one – now.